Some interesting news came out of the Montreal International Auto Show from Chevrolet this week with the announcement that the all-new 2016 Spark will start at just $9,995 plus freight and delivery charges – the lowest MSRP of any car in Canada. Having reviewed early versions of the Spark we were interested in this story as our experience with the 2013 version was very positive. Check out our earlier review. The 2016 model is front wheel drive, four-passenger sub compact equipped with a 1.4-litre four-cylinder engine that develops 98 horsepower and 94 lb-ft of torque (a 16-percent increase over the previous model). A five-speed manual transmission is included, while a continuously variable automatic is optional. It comes with solid safety features such as 10 standard airbags and back-up camera, along with technology that isn’t typically offered in this segment for this price. The Spark comes with a standard 7-inch MyLink touch-screen infotainment system providing owners a smart and simple way to access Android Auto and Apple CarPlay, leveraging the latest technology that customers use every day. OnStar with a 4GLTE Wi-Fi hotspot is also standard. In today’s age with so many cars becoming exponentially more expensive it is refreshing to see a manufacturer providing customers with a value focused model. For more information and specifications on the 2016 Chevrolet Spark, see the latest product guide on media.gm.ca. King of comedy and legendary car collector Jay Leno gets up close and personal with this review of the new 2015 Corvette Z06 convertible. After watching this video it sure makes me want to head down to my local GM dealer and put my order in. The whole clip is worth watching but make sure you check out the 20:35 mark when the Popo makes an appearance…..
Having reviewed the 2014 version of the Dodge Ram 1500 we were very excited to get behind the wheel of this 2015 version of Ram’s award-winning truck. And, this time around we were going to see if all the media hype for the 3.0L V6 EcoDiesel is warranted. Ironically, over the last few months we have seen an incredible drop in fuel prices so as of our test week in December gas prices in Canada were at their lowest level in four to five years and diesel fuel was actually priced at a premium in comparison. Upon getting the keys to the new tester I was pleasantly surprised to see how good the truck looked in its “Western Brown” exterior colour. 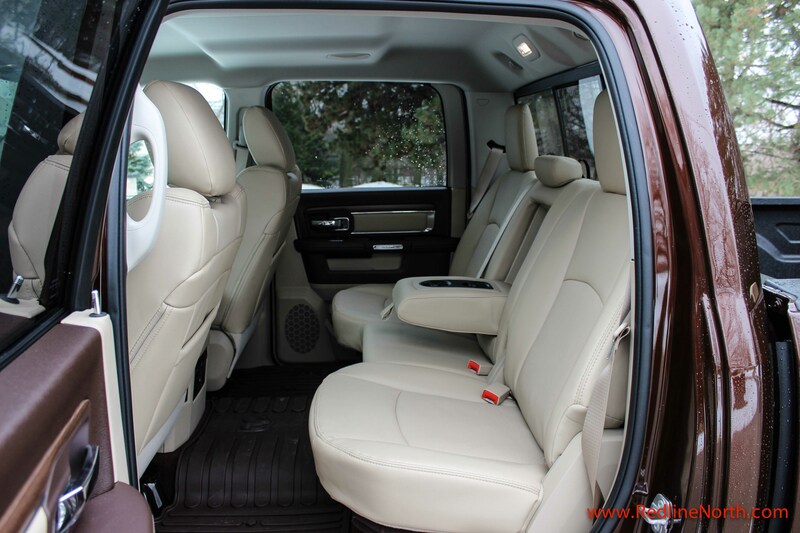 Anyone familiar with the luxury standard of today’s full-sized crew cab trucks will not be surprised by the level of detail in the Ram’s cabin – it is comparable to that of a luxury car with its rich leather bucket seats and high-end interior materials. Some of our favourites include the back-up camera (crucial for parking in tight underground garages) and the nine speaker Alpine stereo system with SiriusXM Satelite radio. Other key features especially useful in the Canadian winter include heated second row seats, dual zone climate control and a heated steering wheel. However, one feature we did not have, but was in the 2014 tester, was the air suspension system which provides drivers with the ability to raise the frame of the truck enabling more travel for off-road use. This feature also lowers the truck for better fuel efficiency and makes it easier to get in and out. For our purposes in the city this is not a feature we would leverage on a regular basis, but it is cool nonetheless. 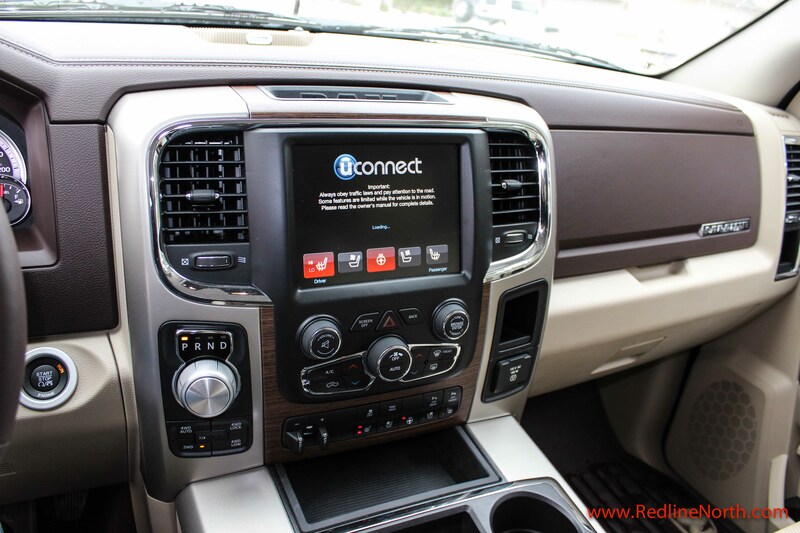 Our tester came equipped with Chrysler’s award winning UConnect multimedia and connectivity package. It’s the most user-friendly setup in any pickup truck we have tested to date, combining an 8.4-inch center touchscreen with a configurable gauge display. UConnect’s touchscreen and steering-wheel controls gives the driver instant access to all the communication and interior features available in the cabin. 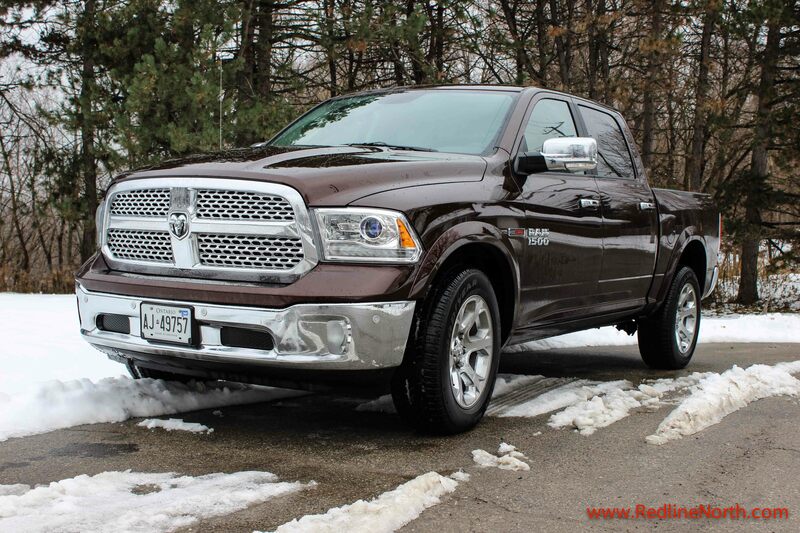 As Dodge’s third highest trim level, the Laramie Crew Cab 4X4 model comes in at a starting price of $40,595 CDN MSRP. However, our tester model came with a base price of $53,695 but was equipped with a range of optional features pushing the actual “total price as tested” to $64,535. The biggest ticket item within all the options is the $4,600 for the EcoDiesel V6. That is a significant chunk of cash but this EcoDiesel engine is game changing and was named one of Ward’s 10 Best Engines for 2014. During our week-long test where we used the truck predominantly as a city errand chaser, with one trip to cottage country, the truck got an average of 10.4L per 100 KM which works out to 23 MPG. This is truly remarkable fuel efficiency for an almost 6,000 lb (2,722 kg) full size truck especially considering the majority of miles were in the city. 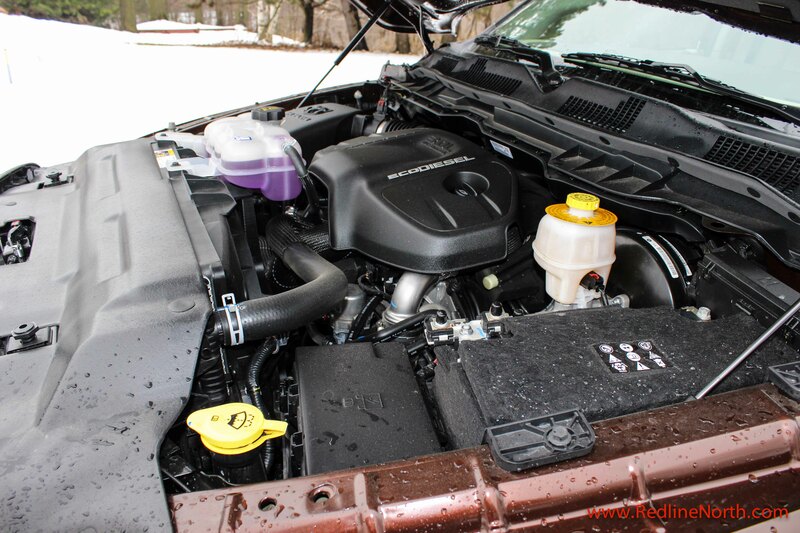 In fact, the 3.0L EcoDiesel V6 is the most efficient engine available today in its class. See official press release. The 3.0L V6 EcoDiesel is a very innovative engine built from a block of compacted graphite iron with aluminum twin-cam heads that put out (240 horsepower and 420 pounds of torque) giving the engine loads of torque for towing (9,200-pound towing capacity). Realistically, it does not have the same off-the-line speed as the HEMI V8 but who needs that? 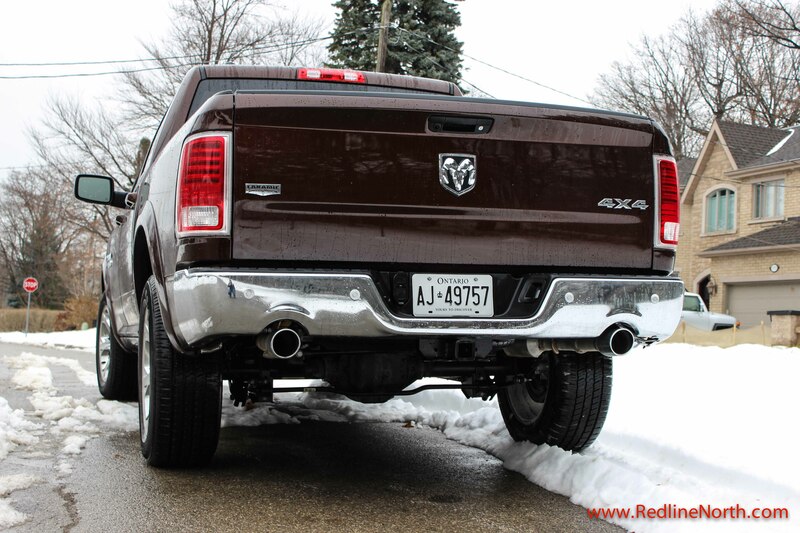 Since it provides a decent 0 to 60 time of about eight seconds (approx 1 second slower than the Hemi) which is very admirable for a full size pick-up that literally sips diesel compared to its gas-fired brethren. The only feature our Ram was missing that would be useful is running boards since getting into the truck is a bit tough without them especially for shorter folks. 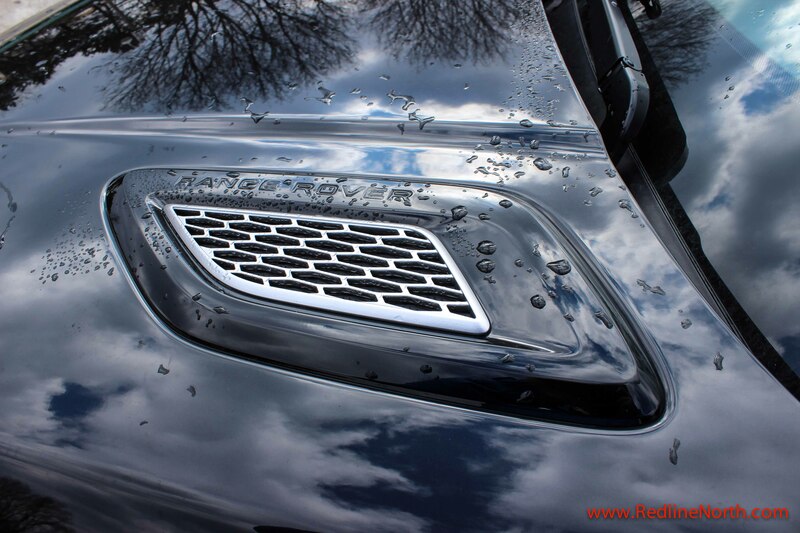 The running boards also provide some added mud and snow coverage for the driver and passengers upon entry and exit. Since the Dodge Ram 1500 with its EcoDiesel V6 is the only diesel half-ton pickup currently available in North America there are no direct competitors. However, the key gasoline competitors to the Ram 1500 are the Ford F-150, Chevrolet Silverado, GMC Sierra, Nissan Titan and the Toyota Tundra. I know Christmas has come and gone but if you are still in the need of a full size truck with superb fuel efficiency make sure you check out a Ram dealer near you! The Cadillac CTS Vsport edition is the top of the line CTS model and boasts a number of added features to the already impressive sport sedan which won Motortrend’s car of the year in 2014. RedlineNorth recently took the CTS Vsport through its paces and we were seriously impressed with the experience. Our test vehicle was a 2014 CTS 3.6L Vsport premium sedan. The base price of the vehicle is $74,49 and with options the total price including destination charge, excluding taxes is $79,580 CAD. The exterior styling of the CTS is a refreshing departure for Cadillac. Stand out features of the CTS styling are the inlaid hood, more aggressively angled front windshield and the inlaid rear spoiler. In addition, the active aero grille shutters not only add to the styling, but automatically close to maximize aerodynamics when additional engine cooling is not required. 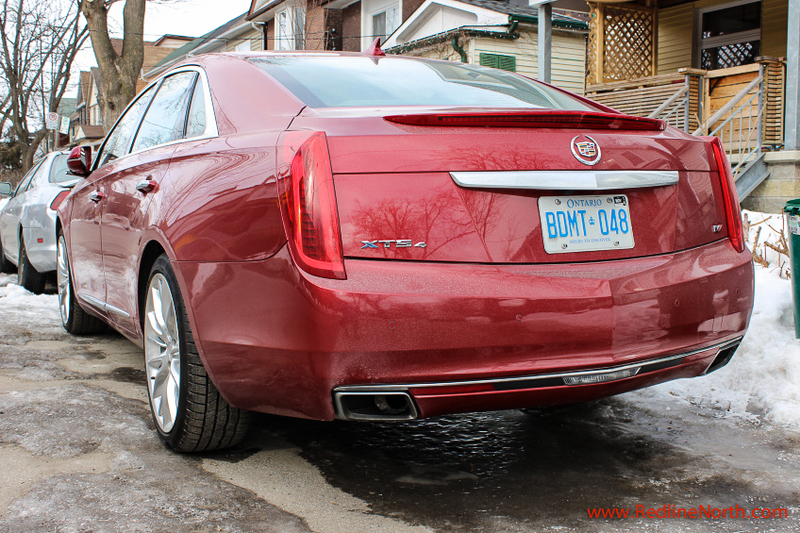 The most noticeable exterior difference to the CTS in the Vsport edition is the Vsport badge on the rear trunk. 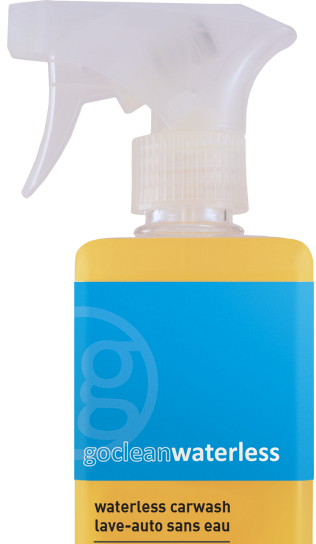 This little moniker tells you that you have something special under the hood. The 3.6L Twin Turbo V6 with an 8 speed transmission rockets the CTS to 96 km/h in 4.4 seconds. Needless to say, acceleration is extraordinary making the car so much fun to drive. Controlling all this power is an electronic Limited-Slip Differential (eLSD) that optimizes the torque split between the rear wheels. This provides enhanced stability and traction control through the corners as well as offering a more precise steering experience. 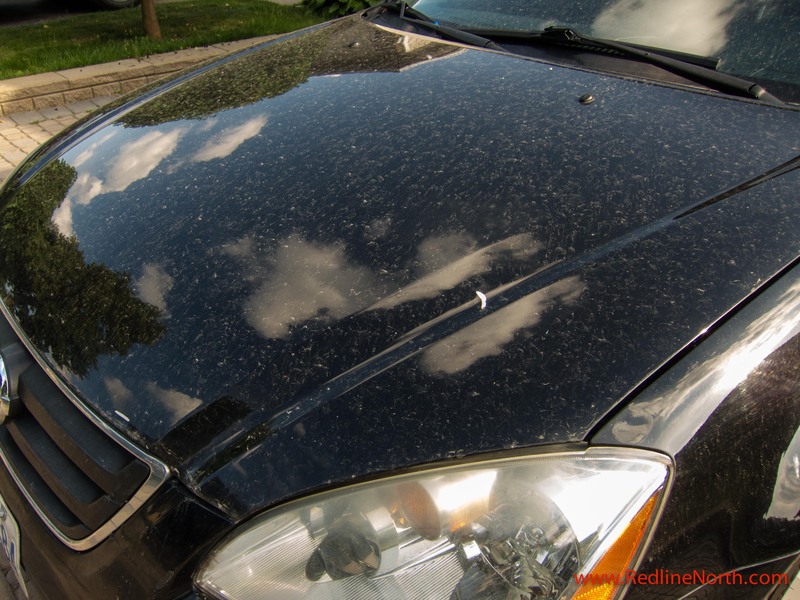 We were impressed with the overall responsiveness of the vehicle. With all the power available in the Vsport edition, the Brembo brakes with 345.4 mm front rotors and available high-performance brake linings are a welcome inclusion and offers an excellent feel when stopping. The interior of the CTS Vsport is well refined with lots of soft touch surfaces, 20 way adjustable seats, ambient lighting and a wealth of technology. The vehicle utilizes a heads up display projected onto the front windscreen. Drivers can customize the information shown to them including speed, RPM, current music selection, etc… Even in bright sunlight the display is crisp and clear. Once we started using it the display became invaluable while driving, allowing us to concentrate on the road and not the dashboard. The CTS Vsport has good all round visibility and offers a cabin that is remarkably quiet despite the monster under the hood. The integration of technology into the CTS extends to the front instrument panel which is a completely digital, configurable display. It does take a little bit of getting use to staring at a screen, but after a while it becomes natural. Shown below on the dash is the ability of the driver to choose from four driving modes Tour, Sport, Track as well as Snow and Ice. Each mode adjusts the driving experience including steering and magnetic drive control. For everyday driving we found the Sport mode provided a good all round experience. Another quality feature of the CTS is the ability to deploy a rear window sun shade at the touch of a button, this coupled with the keyless access which recognizes your key fob and automatically locks or unlocks the doors depending on if you are coming or going, are examples of features added by the engineers and designers that remind the driver you are driving a Cadillac. Additional “nice to have” features are the parallel parking assist, heated rear seats, illuminated front sill plates and what Cadillac calls their Ultraview sunroof. All told, Cadillac has provided a well rounded package in the CTS Vsport. 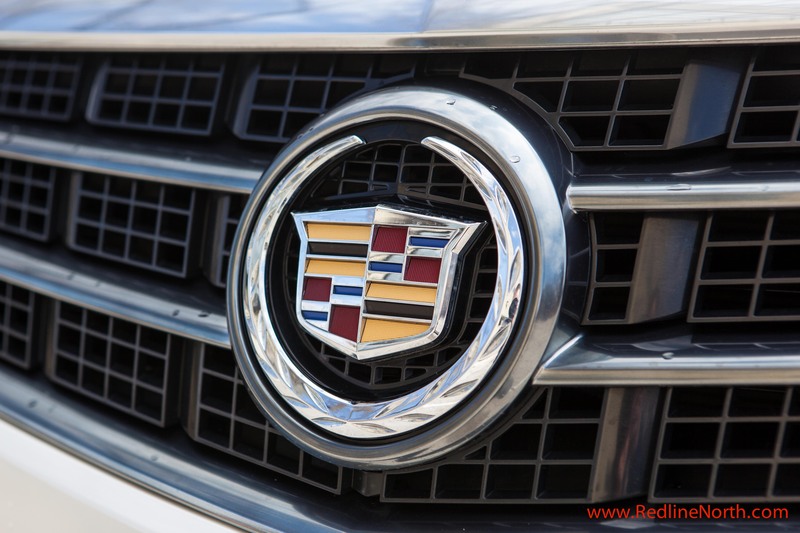 Historically, there has been a perceived status benefit to owning a foreign made vehicle in the luxury segment, however, we think Cadillac has a winner here with the CTS Vsport edition that can break this perception. The combination of the interior cabin refinement, advanced technology integration and overall performance make the CTS Vsport a great option in the luxury performance sedan segment. Those features coupled with the fact it is just so much fun to drive make it a compelling option for target buyers. Nevertheless, the CTS Vsport is up against some stiff competition in this segment, including the Audi A6, Mercedes Benz E class, BMW 5 series and the Jaguar XF. However, at the end of the day we feel it holds its own against the competition from across the Atlantic. 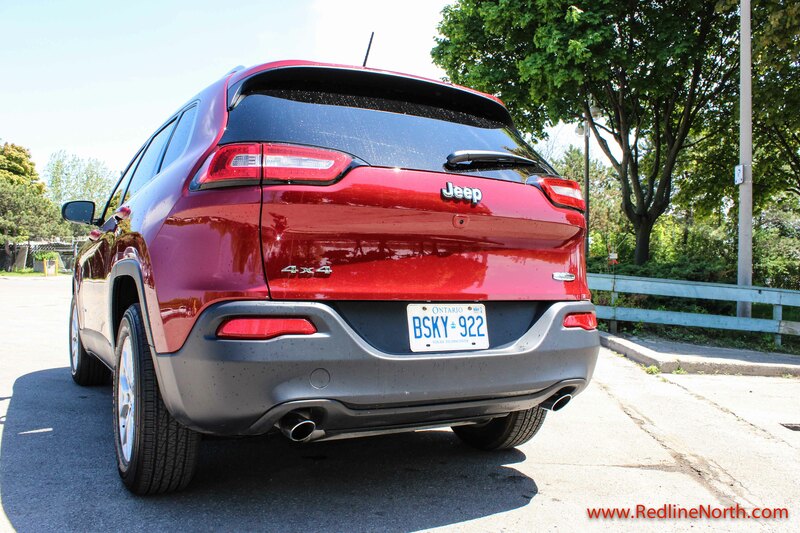 The 2014 Jeep Cherokee marks the return of a classic Jeep nameplate which has been missing from their model line-up since 2001. Originally, Jeep Cherokees were relatively no-frills off-road vehicles that focused more on function over fashion. However, the model quickly evolved in the 1990s to become one of the most popular mid-sized SUV’s for both families and off-road enthusiasts. 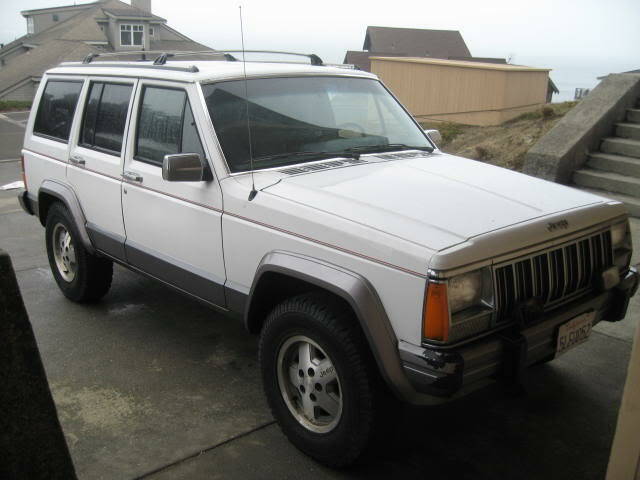 Growing up, my father had a white coloured 1991 Jeep Cherokee Laredo. I have such fond memories of that truck as I first learned to drive on it and it was a beloved chariot on a father-son mountain biking adventure to Mt. Snow, Vermont. Compared to Cherokees of the past, the 2014 model is totally unique as it has been designed from the ground up leveraging the shared platform architecture of the Dodge Dart. While it still provides an adequate level of all-terrain ability for an SUV, this new Jeep Cherokee’s bigger mark is its spacious and well-appointed cabin, smooth ride and powerful V6. Our tester came in the North 4×4 trim model paired with the beefy Pentastar six-cylinder used in the Grand Cherokee. This 3.2-liter V6 engine makes an impressive 271 horsepower and delivers it ponies in a refined manner via an all-new nine-speed automatic transmission. The nine-speed automatic is also included with the base 2.4-liter four-cylinder engine. Although on paper, the four-cylinder makes competitive power for this class, based on the Cherokee’s curb weight the V6 is the best option if you want increased power and towing capacity. Both engines are available with front-wheel-drive and four-wheel-drive configurations. Jeep is actually offering two 4WD systems with the Active Drive I designed as your basic light-duty 4WD system (basically what most consumers think of as all-wheel drive), and it’s just fine if you merely need a little extra traction in winter snowstorms. While next up is Active Drive II, which adds low-range gearing and is aimed at Cherokee buyers expecting to venture farther off the beaten path. Although it’s nice to have that go-almost-anywhere capability when you need it, the reality is most consumers will likely make more use out of its variety of tech features. With an 8.4-inch touchscreen interface available in most models, and an optional safety package that bundles forward collision, lane departure and blind-spot warning systems with automatic high-beam control, adaptive cruise control and an automated parallel and perpendicular parking system this truck is serious about safety and convenience. In fact, this 2014 model is the first Cherokee that will park itself which is a bonus feature in this segment. As for pricing here’s the story – the Cherokee sits smack in the middle of the pack in its small to mid-sized CUV/SUV segment. The only significant options our model lacked was leather seating and a moonroof. 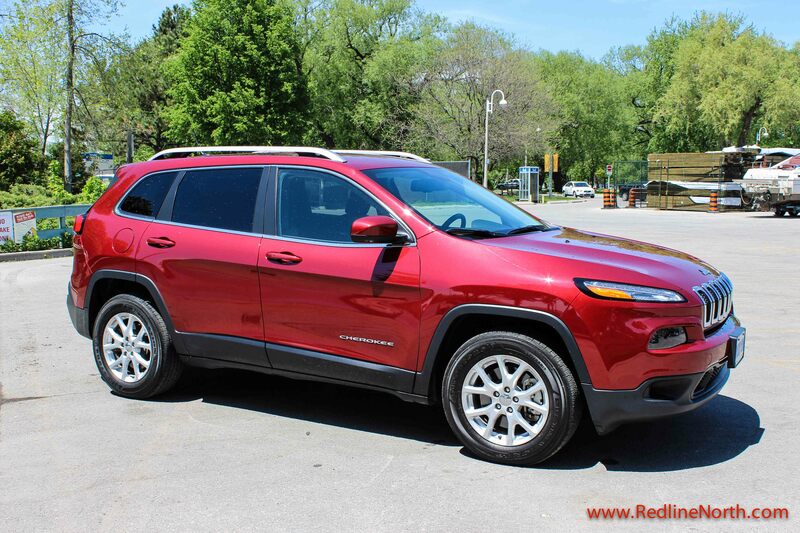 After spending a week behind the wheel in all types of road conditions from summer thunderstorms to traffic in scorching heat we can say the Cherokee model is 100% worth a look if you’re shopping for a small SUV. It provides a ton of value with its stellar drive train and new design features while also bringing back the fun and youthful spirit of the iconic Cherokee nameplate. As for competitors, today’s small crossover SUV segment is crowded with a field of strong models including the Ford Escape, Kia Sorento, Hyundai Santa Fe, Honda CR-V, and Mazda CX-5. But one last thing to keep in mind is the Jeep Cherokee has its own personality and that you cannot say about every model. 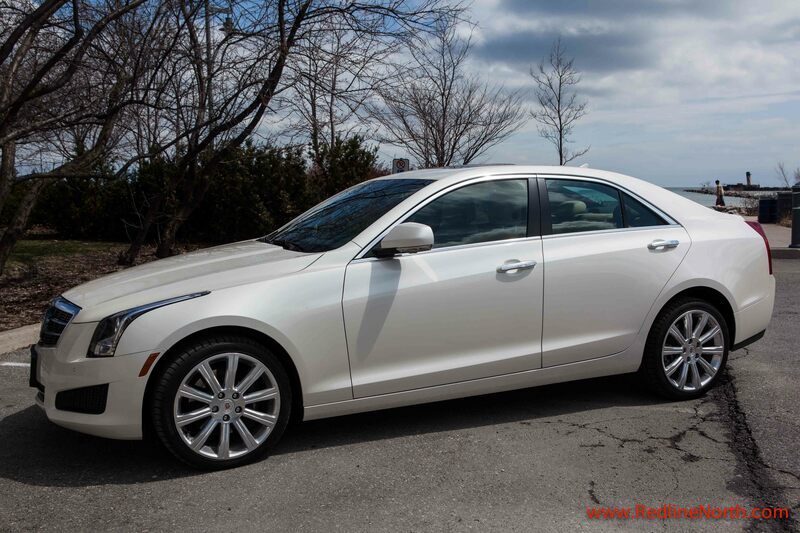 The 2014 Cadillac ATS is a four door, five passenger luxury sports sedan made by General Motors. 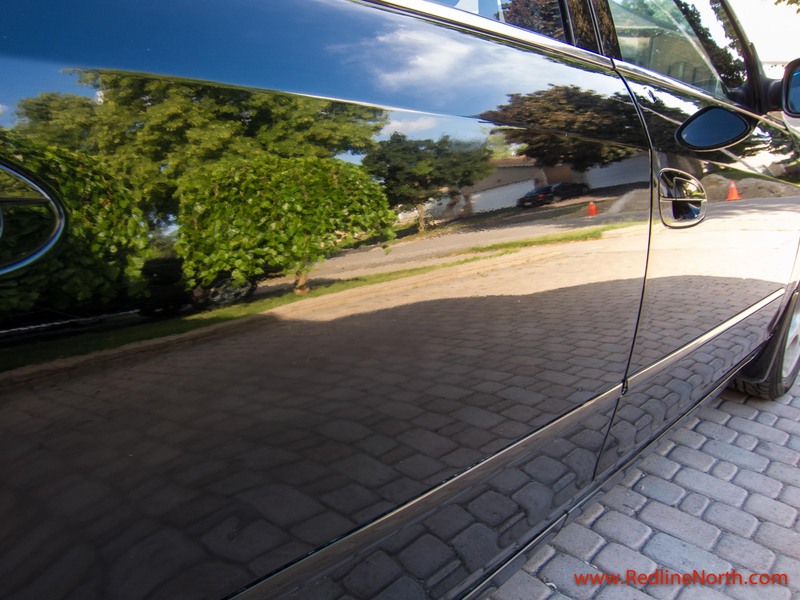 It debuted in 2013 model year to much fanfare and won the North American Car Of The Year award that same year. Having reviewed the 2013 ATS with the 2.0L turbocharged engine last year, RedlineNorth recently had the opportunity to revisit the ATS. This time with a 2014, 3.6L engine with automatic transmission. How does this year’s ATS stack up? Read on to find out. The Cadillac ATS is available with three engine configurations, a 2.0L turbocharged, a 2.5L and a 3.6L engine. In addition, there are four trim levels depending on the chosen engine from standard, luxury, performance and premium. Our test vehicle was a white 2014 with the 3.6L engine, AWD and luxury trim. The standard ATS starts at $35,695 and reaches a base price of $51,480 at the premium trim level. The starting price of our luxury level configuration was $46,675. Additional options, destination charge and air conditioning fee brought the total price of the vehicle to $54,885 CAD. The driver awareness package adds forward collision alert, lane departure warning, auto high beam control and rain sensing wipers to name a few. In terms of style, the ATS shows its aggressive side with sharp angles and a bold appearance. The sculpted headlights and the 18 inch polished aluminium wheels add to this look. The rear of the vehicle incorporates distinctive Cadillac chevron styling cues as well as dual chrome exhaust pipes. All in all General Motors should be applauded for their departure from the traditional Cadillac look and feel. The interior of the ATS has the fit and finish that one would expect in a Cadillac. 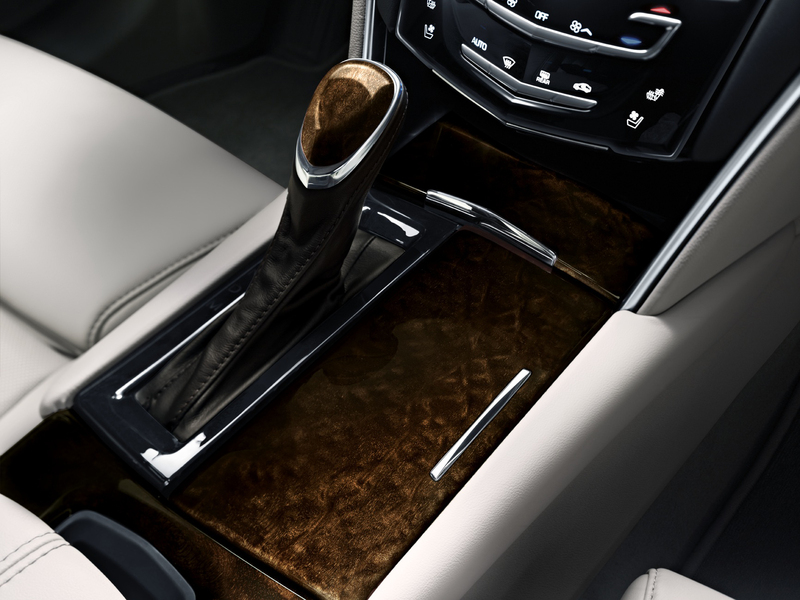 We particularly like the leather seats with precision stitching and embedded Cadillac chevron. The plethora of soft touch surfaces, along with the ambient lighting added to the luxury feel of the vehicle. The dashboard is organized in a logical and ergonomically pleasing way. The haptic feedback on the CUE touchscreen is a great feature, however, we found that a number of the touchpad style buttons on the dash have to be pressed twice for them to engage. After a while we figured out the exact spot that needed pressing, but this is something that requires improvement in the future. Rounding out our likes of the interior was a frameless rear view mirror which blended into the front windscreen and looks great. 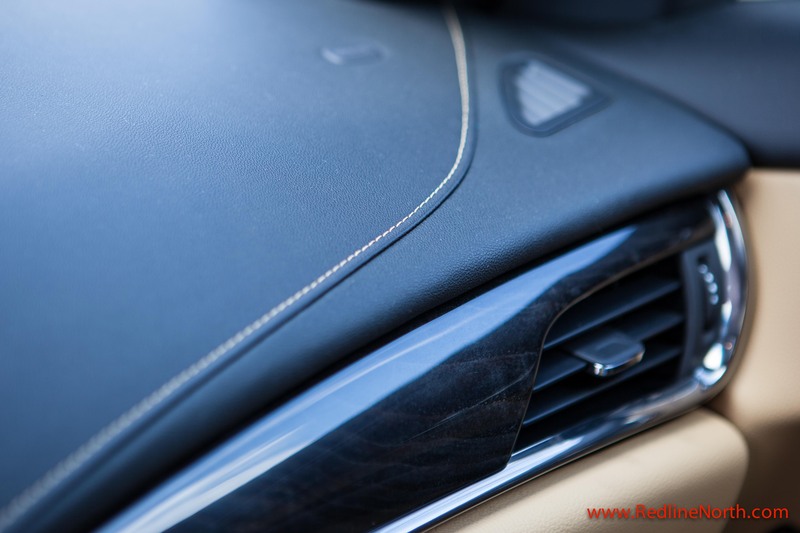 Leather stitching and soft touch surfaces add to the interior quality of the ATS. The back seat of the ATS does have somewhat limited leg room, and is best used for shorter distances, while rear headroom is acceptable. Trunk space is adequate and offers a pass through for those longer items. Although Cadillac engineers have made efficient use of space overall we found the interior of the ATS a touch on the small side. In terms of performance, the 3.6L V6 engine provides 321 hp and 274 lbs of torque. Not surprisingly acceleration was plentiful with reported 0-60 mph times in the six second range. The ATS feels nimble and takes corners well with little body roll. Breaking is responsive thanks in part to the Brembo front calipers. Those in the market for a 6 speed manual have only one choice and that is the RWD 2.0L turbo model unfortunately. It would be nice for the manual transmission option to be available across all engine configurations. The stated fuel efficiency of the 3.6L engine with AWD is 11.6L/100 km city and 7.6 L/100 km highway, which is based on the current two cycle test. Next year Natural Resources Canada will require reporting based on the more stringent 5 cycle test which translates into 13.1L city and 9.0L highway. Note that the 3.6L engine in the ATS only requires regular 87 octane fuel. Key competitors to the ATS are the BMW 3 series, Audi A4/S4, and the Acura TSX and we think it does a good job stacking up against its German and Japanese rivals. Despite having a slightly tight interior feel and touch sensitive buttons that could use a rework, overall the ATS is a blast to drive. Throughout acceleration, cornering and breaking the ATS performs admirably. 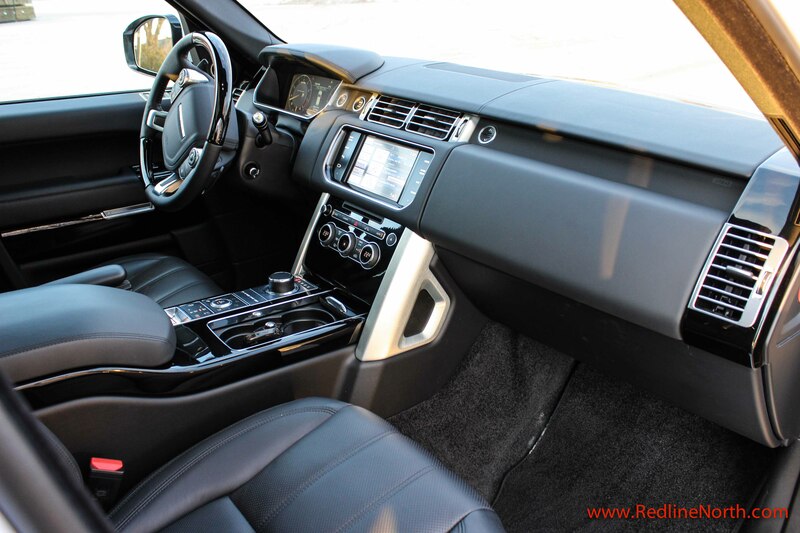 We loved the look and feel of both the exterior and interior of the vehicle and with a $46K base price one can enter the world of the performance luxury sedan with some nice options for under $50K. We also look forward to a new ATS stablemate, the 2015 ATS Coupe later this year. The Range Rover brand is truly iconic since people who know nothing about cars are aware of its rich pedigree of craftsmanship, luxury and performance. Resulting from this amazing brand recognition, Land Rover stands out among its competitors as one of the world’s top brands. Interestingly, today, Land Rover is now owned by India’s Tata Motors who acquired both the Jaguar and Land Rover brands in a blockbuster deal in 2008. Over the past six years, Tata has done a stellar job of rejuvenating the brand globally. Consequently, when you look at Land Rovers’ current 2014 model line-up it’s obvious the nameplate has come a long way since Maurice Wilks constructed the first Land Rover back in 1947 after being inspired by the American World War II Jeep. 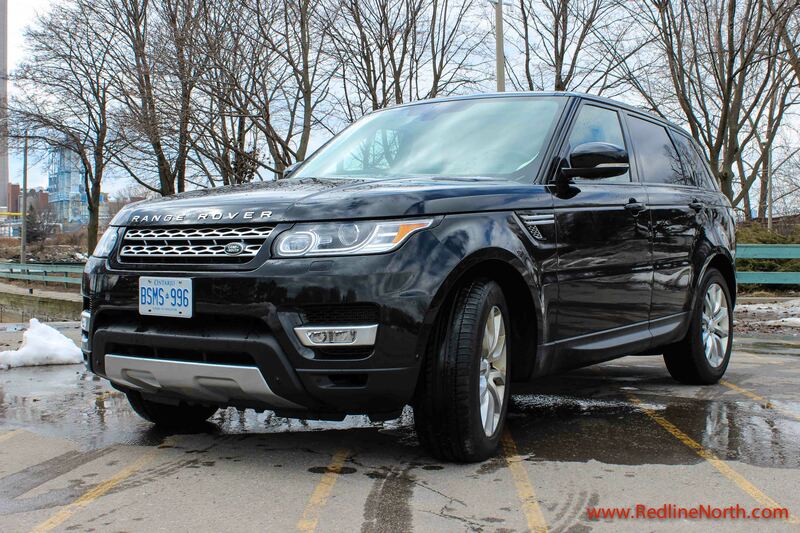 Last month, we had the incredible opportunity to experience first hand Land Rover’s 2014 Range Rover Sport HSE and the 2014 Range Rover Supercharged model. We started behind the wheel of the newly redesigned Sport HSE model equipped with the 3.0-liter supercharged V-6 which pumps out 340 hp and 332 lb-ft of torque. Redesigned from the frame up to be lighter and more nimble, (it tips the scales 800 pounds lighter than the 2013 model) Land Rover has turned its stylish SUV into a family friendly SUV for those who strive to drive a premium vehicle. Although now longer than its predecessor by 2.5 inches for a total of 191 it is still over four inches shorter than the 2014 Cadillac CTS sedan. The Sport was a ton of fun to drive in both city and highway environments and its size works well for an urban environment as I never felt it was too big. As for overall appearance the black on black colour scheme along with the motor hood venting provides a sinister and sporty look. A few welcomed features during the last few days of our Canadian “hell” winter were the heated windshield along with the ultra comfy heated seats and heated steering wheel. Although there are several other engines offered in the Sport trim including the unreal supercharged 5.0-liter V-8 the 3.0 V6 engine is more than enough power to propel the Range Rover Sport. Land Rover estimates the V6 configuration provides a 0-60 mph performance time of 6.9 seconds which should be enough for most families aside from the Andretti’s. It’s amazing how capable this new Range Rover Sport really is and it’s a bit of a shame that few owners will ever challenge it on anything rougher than an unpaved road on their way to the cottage. Its perfect combination of subtle suspension and Brembo brakes results in excellent driving and braking capability at all speeds and it does this in spite of the beefy 4700 lb curb weight. Overall, the Range Rover Sport is an amazing ride and I would truly love to have one in the driveway. 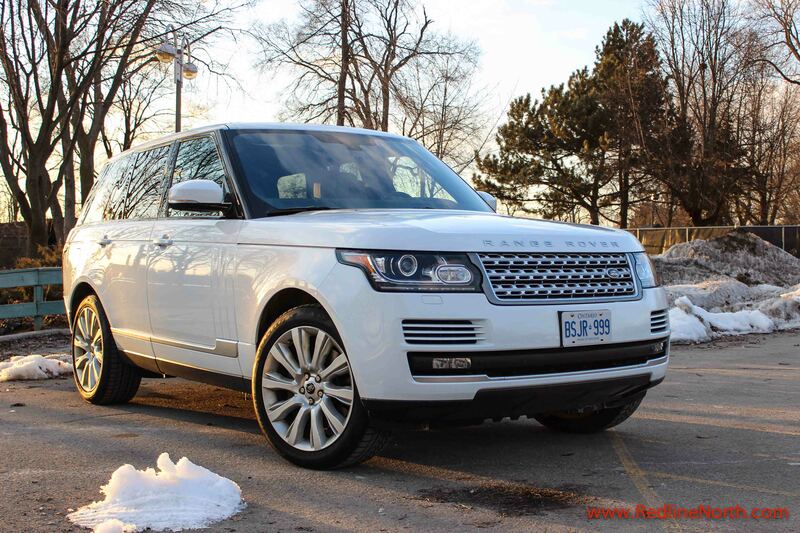 Our test model came in at $86,000 CDN reinforcing the premium price Range Rover’s garner in the marketplace. Next up is Land Rover’s flagship model, the Range Rover Supercharged, which brings an out of this world level of power and size to the ring. Beginning with its regal design the Ranger Rover Supercharged is as close as you can get to having your own personal chariot. Its stance exudes confidence and poise and let’s be honest if you are driving one of these you want the world to know you have made it. Designed to compete with the big boys of high-performance luxury SUVs including the Mercedes GL 63 AMG and Porsche Cayenne Turbo, the supercharged 5.0L V-8 engine delivers a whopping 510 hp and 461 lb-ft of torque. Kudos to the team at Land Rover as they have done a magnificent job designing this new powertrain. When you stomp on the gas pedal it provides the acceleration of a V8 supercar and launches like a cheetah. At one point during the week-long test, I seriously thought I may need some wheelie bars. The power is instant and visceral and the V8 sound that goes along with it is intoxicating. With a sizzling 0-60-mph time in the range of 5.0 seconds it is the most powerful Land Rover ever built and driving it is a sure way to get the adrenaline pumping. But the best part of all is it’s a true wolf in sheep’s clothing. Aside from the Supercharged badge on the tailgate nobody knows it has so much power. Hence, you pull up beside someone at a stoplight, and when the light turns green you might as well be in a Z06 Corvette since most vehicles will not even come close to challenging you. Having said this, I’m not condoning this type of activity as it’s illegal, but this is a risk associated with owning the supercharged V8 model. The Range Rover includes a host of other goodies that make life easier and driving a little safer too. To name a few there’s a surround camera system, reverse traffic detection with blind spot monitoring and closing vehicle sensing, adaptive cruise control, lane-departure warning, rain sensing wipers, an 18-speaker Meridian audio system, massaging and heated seats and best of all are the heavenly front headrests which are hands down the most comfortable headrests I have ever experienced. Although designed to be an incredible off-roader it is way too beautiful and expensive to take to the trails and I’d be surprised to hear that any of these models ever see the mud and water they are designed to tackle. 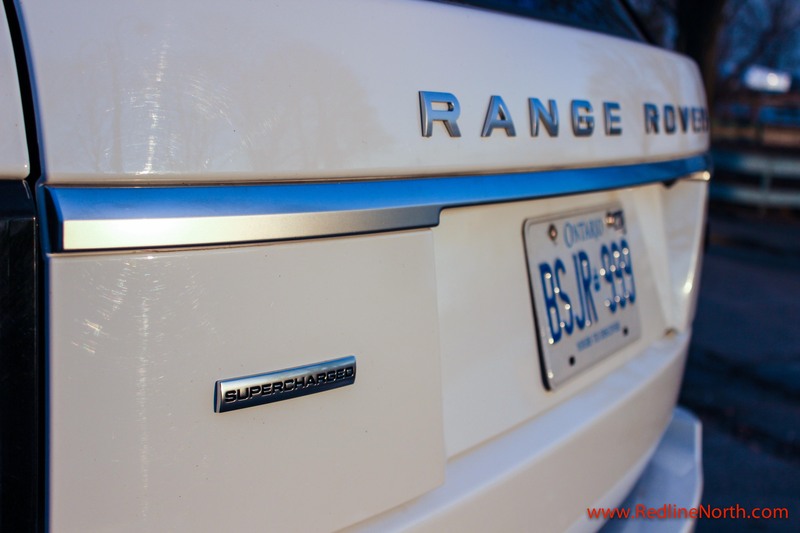 Coming in at a price tag as tested of $127,145 the Range Rover Supercharged is certainly not for the everyman. Nope, this vehicle is designed for those who have successfully climbed the corporate ladder and/or entrepreneurial rock stars along with professional athletes and celebrities. However, there is other important group worth mentioning who have had a long history with Land Rover products and that is the British Royal family. A few years back in a story we did about the introduction of the Range Rover Evoque we also included a video of Queen Elizabeth II driving her Land Rover equipped with a manual transmission. And just this past summer, we saw Land Rover once again star as the vehicle of choice for Prince William and Kate at the birth of Prince George. Kudos to Land Rover since you could not ask for better global brand ambassadors! Having recently reviewed several Cadillac models including the SRX, ATS and now the XTS we can honestly say they are all a treat to drive. Over the last few years, GM’s top brand has truly undergone a renaissance as a result of GM’s heightened attention to detail, design and performance. Seriously, as car enthusiasts what’s not to love when the car looks good, luxurious and fast? 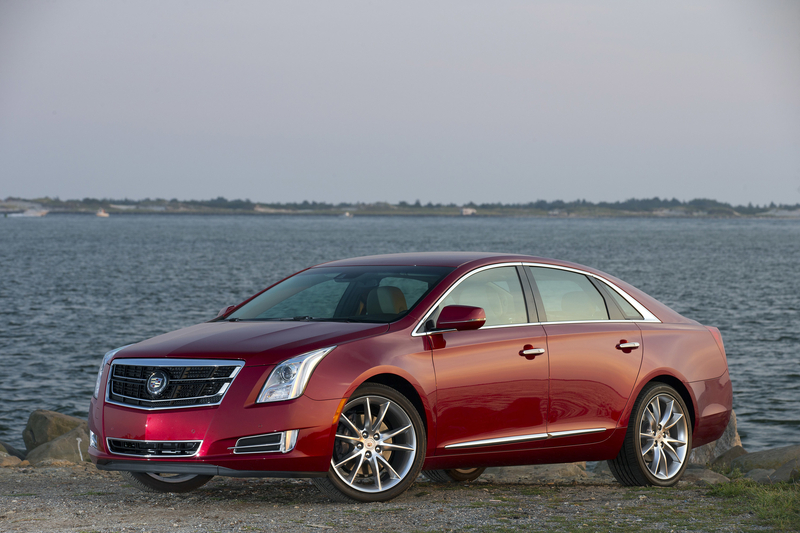 Designed to replace both the Cadillac STS and DTS, the XTS is slightly smaller than the DTS but larger than the STS. Production began in May 2012 at the Oshawa, Canada assembly plant and the model was officially launched in June 2012. The XTS is available in both front-wheel drive and all-wheel drive configurations. Here in Canada, it’s very exciting that this beauty is made in our own backyard for the North American market. 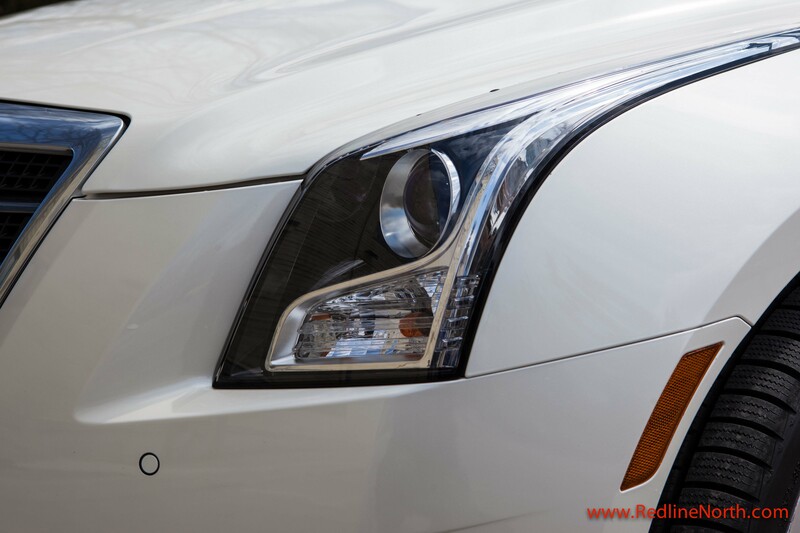 In February 2013, GM began manufacturing the XTS in Shanghai, China for their domestic market. Our XTS tester came in the top of the line AWD Platinum Vsport trim which includes GM’s new twin-turbo version of the 3.6L V6. The new engine develops a whopping 410 horsepower and 369 lb ft. of torque. All this power translates into a “pin you into the seats performance” but with the panache and demure of a 2014 luxury model. The six-speed automatic uses the same gear ratios as in the naturally aspirated XTS but with a shorter final-drive ratio resulting in a lively acceleration band. It’s so powerful I’m confident the XTS could go head-to-head with many of today’s twin-turbo V8’s offered by its German competitors. And the truth is in the numbers, as the Vsport goes from 0 to 60 in 5.2 seconds and has a quarter-mile time of 13.6 seconds based on most tests. That’s super fast for a large four-door sedan. In spite of its immense powerplant, the Cadillac is not a fuel hog by today’s standards with GM’s provided fuel economy ratings of (L/100 km): 13.2 city, 8.3 hwy. Now of course, the Vsport requires premium fuel but it’s totally worth it when you get behind the wheel. As for pricing here’s the story. However, if all the Vsport’s power and features are not required you can purchase a base XTS model at a more reasonable price just above $50,000. 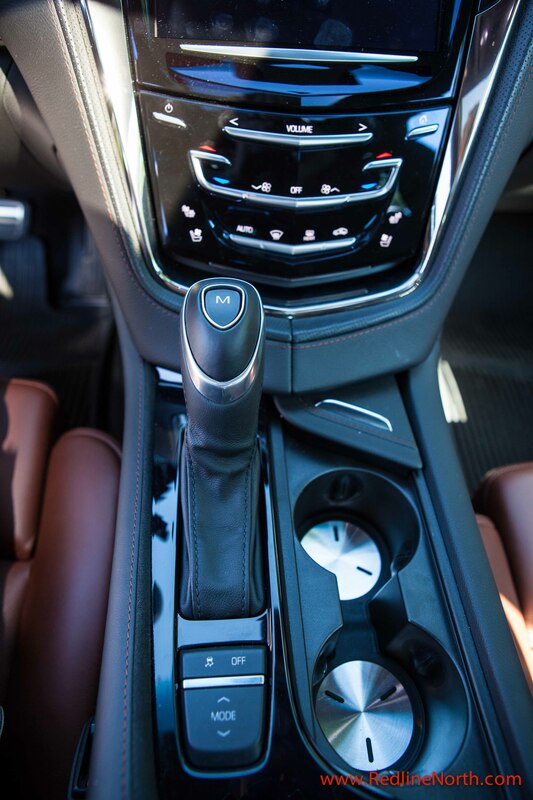 There is no mistake as the XTS interior is ultra luxurious with leather, wood and chrome trim blended together to create an elegant cabin environment. After driving it around town you start to feel you are commanding a rolling stateroom, only interrupted by the growl of its performance underpinnings. Some of these features include Brembo performance brakes, paddle shifters, electronic limited-slip-differential, magnetic ride suspension and an HUD (heads-up display) making the Vsport a bona fide luxury rocket-ship. At the center of it all is the eight-inch touch screen seamlessly located in the dashboard and powered by Cadillac’s User Experience (CUE). Its features include capacitive sensing touch control with proximity sensing, haptic feedback, gesture recognition and enhanced voice recognition. This high-tech feature is very intuitive and designed for the younger tech savvy demographic Cadillac is targeting. 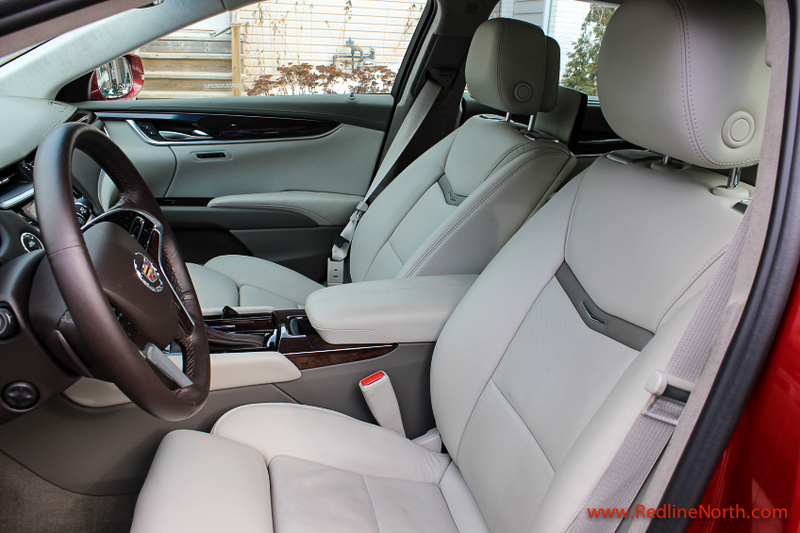 The XTS competes well with its big sedan brothers as its spaciousness is impressive with rear seat room large enough to do double duty as a chauffeur driven vehicle. Also, it brings with it a massive trunk capacity of 509 litres/18 cubic ft. which is more than many of its competitors including the BMW 7 Series, Mercedes S-Class and Audi A8. For those consumers who want performance in a full size sedan without reaching the over the top price tag of a Mercedes AMG or BMW M series, the Cadillac XTS Vsport is the car for you. As a Canadian made luxury cruiser with more ponies than you will ever need under the hood, the Vsport AWD Platinum model is an out-right bargain at $75,000 when compared to its European rivals. Honestly, if I had the bucks I would love to wake up to the XTS Vsport in my garage. 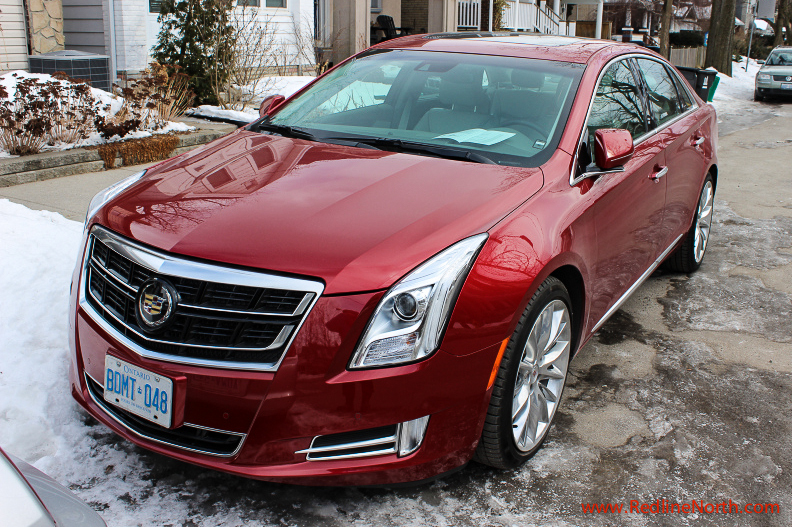 We will be reviewing the XTS’ little sister the CTS Vsport later this summer so keep your eyes out for that review.